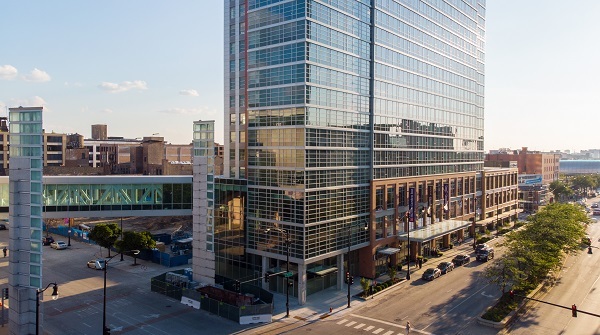 ProFood Tech exhibitors and attendees can stay here at an exclusive event rate and only a deposit of first night’s rate plus tax is charged at time of booking. Valet parking is available for $59. Check-in is at 3 p.m. and check-out is at 12 p.m.
Hilton Honors members can also earn reward points when booking in the official room block, just as they would by booking directly with the hotel. Simply include your Hilton Honors account number in your reservation. Tweet about the event using #ProFoodTech! Don’t forget to follow us @Expovision_inc. Expovision is the ProFood Tech Hotel Reservation Office. If you’ve been contacted by a hotel scammer, please report them to profoodhotels@expovision.com. Please note: Rates are as of 1/15/2019 and are subject to change until booked.